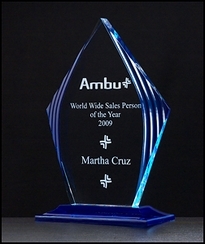 3/4" thick W: 5-625" x H: 8-3/4"
These beautiful engraved trophies are perfect to showcase your appreciation for that diligent worker or loved one. 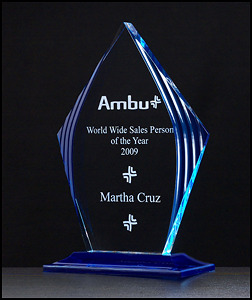 The engraved trophies are made from strong engravable cast acrylic. All of your acrylic trophies are laser engraved with your choice of font. Each trophy comes with 100 letters engraved free with each additional letter costing only 20 cents each. Also, check out our logos that can be engraved at the top to give it a professional and personal look. You can also email us your custom company logo or team symbols at an additional cost of $25. Please email us your text and logo or photo to: anleng56@yahoo.com, and we can get started on your award right away! Our Award Trophies are the perfect way to recognize and show appreciation for a job well done.